Forget the cornball romance and creepy action figure fixations and excruciating store clerks. Seems someone, somewhere at Nintendo remembers how to make a good video game trailer. Love, Heartbreak, Smash Bros. This Nintendo Commercial Has It All. The answer was staring them right in the face, this whole time. Just make it using another Nintendo video game! 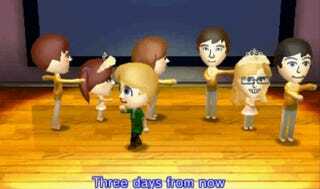 In this case, Tomodachi Life. Never have I wanted to play Majora's Mask more. Going to be sorely disappointed when I'm reminded it's not a jazzy musical.